Seeds of Learning has worked with communities to build and establish Learning Resource Centers (LRCs) throughout Nicaragua, which provide educational resources to under-resourced communities. In addition to the LRCs, we have also built and continue to support small libraries at several public schools. Scroll down to see a full list of these LRCs and the programs they offer. The LRC in Ciudad Darío serves as the main hub of SOL’s work in Nicaragua and is managed by staff. 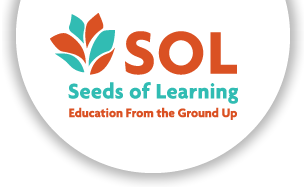 The other LRCs are jointly managed by SOL and the community members, and staffed by volunteers, teachers, community members, and (in some areas) SOL scholarship recipients. The centers are in various stages of transition towards full management by the local community. LRCs and libraries are open to students, teachers, parents, and community members free of charge. As you can read in the list below, they vary in size and available programs, although all include small libraries, educational materials, some technology, games and story books for kids. In 2018, our LRCs and libraries received over 99,000 user visits. 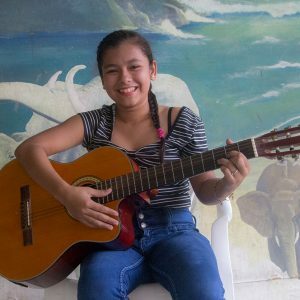 Check out this video of a Reading Campaign that is currently underway at one of our learning centers in the community of El Triunfo. Ciudad Darío LRC: Our original, flagship LRC is our largest center, and serves over 125 users per day. It is open to the public five days a week for an average of six to eight hours daily. This LRC also offers the most programs, including: Children’s Areas (for two separate age groups), Research Room, Study Hall, Computer Lab, Teacher’s Resource Area, Reading Campaign, and Dance, Music, Painting, and English Classes. Each day our staff lead a variety of activities, such as story time and crafts, for children. This LRC is also the home of our Ciudad Darío staff offices. Click here to read more about the various activities and programs available. Las Delicias LRC: This LRC is open to the community five days a week for an average of three or more hours daily. It is staffed exclusively by volunteers—mainly our scholarship students. A volunteer committee oversees the strategic and long-term operations of this center. The Las Delicias LRC is home to a Children’s Area and a Research Room. Volunteers plan and lead tutoring programs, craft activities, fundraisers, and sometimes even music or dance classes. We are very proud of how involved and engaged our volunteer leaders are! Asiento Viejo LRC: This LRC is also open to the community five days a week for an average of three or more hours daily. The programs offered and level of volunteer involvement are very similar to the Las Delicias LRC. The Asiento Viejo LRC is home to a Children’s Area and a Research Room, and volunteers are in charge of keeping the center open and planning craft activities, special events, landscaping activities, providing maintenance, and keeping a book and resource inventory. Casas Viejas School Library: This library is open to the community two days a week for an average of three or more hours daily. The programs offered and level of volunteer involvement are very similar to the Las Delicias LRC. The Casas Viejas library is home to a Children’s Area and a Research Room, and volunteers are in charge of keeping the center open and planning craft activities, special events, and maintaining a book and resource inventory. Las Mesas School Library: This library is open to the community three days a week for an average of three or more hours daily. The Las Mesas library is home to a Research Room, and some activities for children are also offered. Volunteers are in charge of keeping the center open and planning craft activities, providing maintenance, and keeping an inventory of the resources. La Remonta School Library: This library is open to the community three days a week for an average of three or more hours daily. The La Remonta library is home to a Children’s Area which offers activities for children, as well as a small Research Room. Volunteers are in charge of keeping the center open and planning children’s activities, providing maintenance, and planning special events and activities. El Triunfo LRC: This small LRC kiosk is open from Tuesday through Saturday. It is visited by around 30 children every day, who participate in educational activities, a reading campaign, tutoring, crafts activities, games, and sports. Basic library services are also offered. Staff estimate that another 30 people visit the center daily for recreational purposes, since the kiosk sits in the middle of a small park with playground equipment. A local women’s group (linked to the LRC) has started a vegetable garden funded by the nonprofit organization Winds of Change. They have also started a fundraising campaign to build a fence around the LRC and park. Pedro Arauz LRC: This LRC is open three days a week for three hours daily. On average, around 15 children use the center every open day. Activities offered include a reading campaign, dance classes, tutoring, crafts, games, drawing, computer classes, library services, a sanitation campaign, and sports. Adults visit the center along with their children, and also participate in computer classes. Villa Japón LRC: This large LRC is open five days a week from 8:00am until 4:00pm. The center is visited each day by around 70 children. This LRC offers a variety of activities, including library services, a reading campaign, arts and crafts classes, tutoring, IT classes (focused on computers and tablets), and English and French classes. The LRC also hosts a variety of special events, such as celebrations for Mother’s Children, International Children’s Day, Independence Day, etc. 20 local teachers also visit the center often for library services, presenting videos to their students, using the multimedia projects, and holding meetings. Internet is available and offered to community members for a small fee. The funds are in turn used to pay for electricity and routine maintenance. Mesas de Acicaya LRC: This new LRC is open five days a week for four hours a day. The center houses reading materials, digital technology, and a variety of educational and recreational materials, such as puzzles, craft supplies, sports equipment, and musical instruments. The LRC is managed by local youth from an organization named Caminos al Saber (Paths to Knowledge). These youth proposed the initial project to Seeds of Learning, and have led local efforts to assist in the construction of the center, mobilize resources, organize community participation, keep the center open, and plan all activities. The LRC currently offers a daily reading club, arts and activities, and educational games. On Saturdays it is also the site of high school classes, since the local school does not have enough space for all the enrolled students.